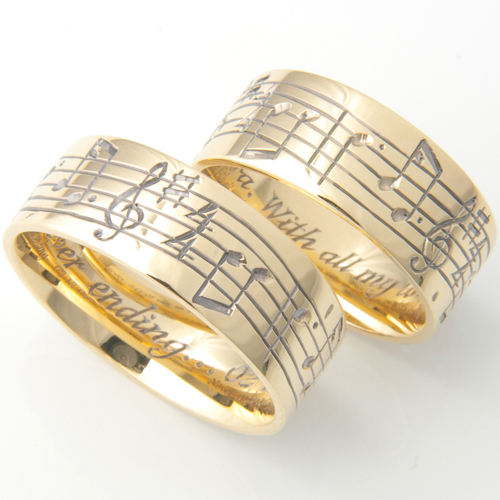 18ct Yellow Gold Musical Notes Hand Engraved Wedding Rings — Form Bespoke Jewellers Ltd.
His & Hers matching wedding rings, personalised with the musical notes. This couple came to us wanting something original in design incorporating their favourite piece of music. They chose a pair of 7mm 18ct yellow gold flat court rings. Although this was tricky to design and to mark out the musical notes, it worked brilliantly. The couple also chose to have a message engraved inside the rings to mark their special day. The engraving inside and out has been blackened to make it into more of a feature. We’re really pleased with the final results and our customers loved their Musical Notes Hand Engraved Wedding Rings. This design is also available in a selection of widths to suit you. They can be engraved with notes from a piece of music which is special to you.